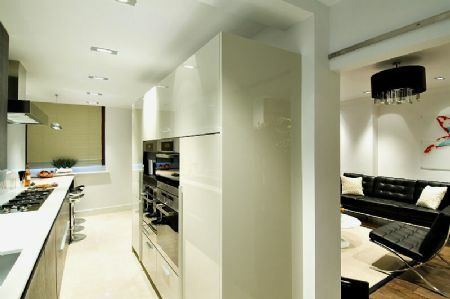 London Choice® London Apartments has just introduced a very special and unique serviced London apartment. Apartment One at Lancaster Gate Hyde Park Apartments is London's most luxurious fully-serviced apartment. (1888PressRelease) August 23, 2009 - Situated just steps from Hyde Park and newly refurbished to the highest bespoke standards this stunning fully-serviced London apartment is the utmost in luxury lifestyle living. This bright and unusually spacious apartment is individually designed with meticulous attention to detail and to the highest specification. Included as standard in the apartment specification is American walnut flooring & bespoke walk-in wardrobes, air-conditioning & under-floor heating throughout, Binova kitchen units with state-of-the-art Miele kitchen appliances and unique gadgets, magnificent contemporary bathroom suites and guest toilet, automated Lutron lighting system and every amenity and convenience catering to the most discerning of guests. This London apartment also features its own private off-street entrance, private elevator key access and a wonderful inner outdoor patio shared by the two main bedroom suites. There is a separate additional reception area with a large double sofa bed for two additional guests. Each bedroom suite features a large walk-in dressing room and luxurious en-suite bathrooms. The Master Bedroom features a huge 23 foot lavish contemporary spa / bathroom suite with a lovely skylight, a large double-ended bathtub with Whirlpool & Jet-Spa (32 Jets), plus a huge rain-shower and a 23" Water-Proof Television. Additionally, there is also a guest toilet in the apartment. There is also a 52" Flat-Screen Television in the main reception, plus an additional 52" Flat-Screen Television in the master bedroom suite. This incredibly spacious serviced London apartment can comfortably sleep up to 6 guests. 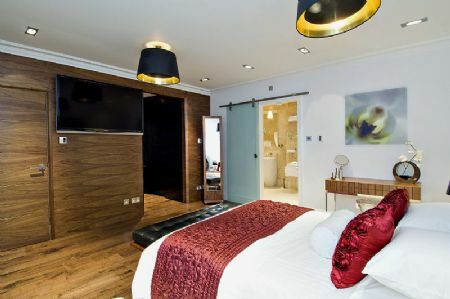 Occupying an enviable position in a peaceful residential tree lined square opposite Hyde Park, and within walking distance of Marble Arch, Lancaster Gate offers to cater for the demands of the discerning business and leisure traveller. Extra Luxury towels, toiletries, complimentary coffee, tea, sugar, milk, fresh fruit, biscuits and chocolates are provided for your convenience and to help you settle into your London address. With Hyde Park on your doorstep, few can boast to have a palace and a lake in their front garden. Hyde Park, one of the world’s finest city parks, provides 350 acres of great beauty and serenity on your doorstep. It’s hard to imagine a better position for those who relish taking advantage of the truly global range of brands that London has to offer. Bulgari, Jimmy Choo, Hermes and, of course, Harrods and Selfridges – are within easy reach from this magnificent central London apartment. Paddington station is very close by with the Heathrow Express speeding travellers to Heathrow in only 15 minutes. Key features of this incredible fully-serviced London apartment include: 2-3 Bedrooms, air-conditioning throughout, under-floor heating throughout, private furnished patio, 2 spacious en-suite luxury bathrooms, guest toilet / cloakroom, double ended whirlpool & jet spa (32 jets), huge rain shower with skylight in main bath, bespoke walk-in wardrobes, fully-fitted bespoke Binova kitchen, coffee / espresso machine, integrated Miele appliances, dishwasher, washer / dryer, stylish dining for 8, 52” flat-screen TV in main reception, 52” flat-screen TV in master bedroom, 23” water-proof TV in main bathroom, I-Pod docks in all main rooms, stereo, DVD player, designer telephones throughout, exclusive fax machine, large work desk, automated Lutron lighting system, Video Entry System, direct lift access, plus private street access, wood & glass feature staircase, bonus reception & sleeping area, private safe, central Hyde Park location, luxury bed linens & towels, wireless internet, complimentary toiletries, Daily Maid Service...and a supreme feeling of space and style rarely seen in London. 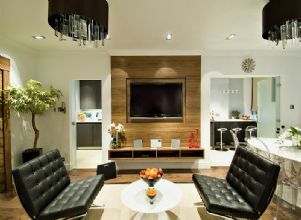 London Choice® (LondonChoice.com) is a division of Choice Serviced Apartments® Worldwide. 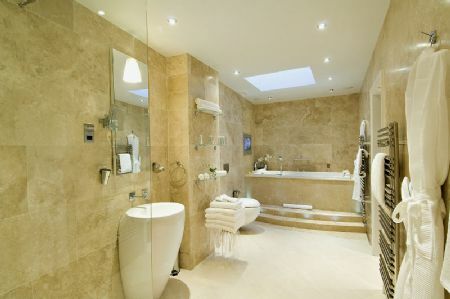 Established in 1998, London Choice® is the leading provider of fully serviced London apartments. The company was set up and developed to make finding a London Apartment simple and stress-free, regardless off length of stay. Whatever your requirements, business or leisure, London Choice® have London accommodation to suit your every need. From single travellers to large families, couples to groups of friends, more and more visitors’ are discovering the flexibility & savings of staying in a serviced London apartment.